One of the main reasons I am such an advocate of meditation is because of the effect it has on intuition. For those of us, who are looking to build their intuition, or connect better with our gut, meditation is one of the most powerful tools I have found. 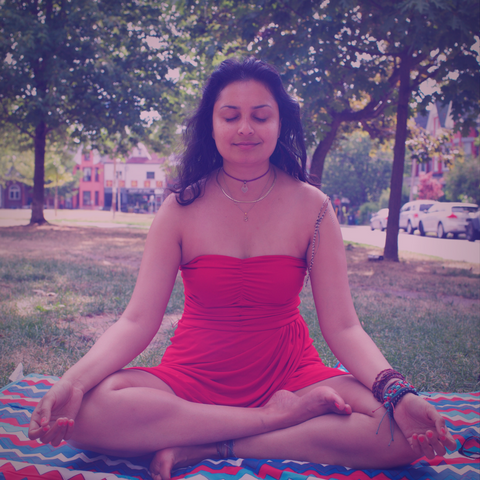 In this blog post, I’ll answer your questions about meditation and its relation to intuition. So many of us spend way too much of our time listening to the outside voices in our life, like our parents, society, and the world. Instead of listening to our inner self, our true self, and our authentic self, we listen to everyone else. If all of us spent less time listening to the outside world, and actually listening to what we truly want, we would be living a more fulfilling life. For the longest time, I heard my intuition tell me what I should be doing with my life. But my parents told me to take another path. I listened to them at first, because it felt like the ‘right’ thing to do. I wanted to be a good daughter. But constantly, that voice inside my heart, my intuition kept at me, telling me I was on the wrong path. My intuition was adamant that I should change my path. The thing about our intuition is that if at first we don’t listen to it, the voice gets stronger and stronger, but eventually, if we don’t listen to it, it stops talking to us altogether. Luckily enough, my intuition kept bugging me, and telling me to try a different path. For ten whole years, it told me I was on the wrong path. Everything I did just didn’t feel right, because it wasn’t the path for me. When we are living on the right path, everything falls into place seamlessly. When we are living the wrong path, everything seems stilted, suffocating, and slow-moving. Intuition helps us take off the many masks we wear to find out what are we truly supposed to be doing with our lives. When people tell me they are searching for their life path, I tell them to start meditating, so they can start listening to their intuition better. The basic tenet of meditation is for us to come back to the present moment. In this day and age, we spend a lot of our time, away from the present moment. We spend it either in the past worrying, or in the future filled with anxiety. Either way, we are not connected with our true present self. In order for our intuition to work at its prime, the primary component is present moment awareness. The reason for that is the more present we are, the better we are able to hear our intuition speak. In the hustle and bustle of daily life, our intuition might be telling us something, but we might be too busy to actually hear the words. In that case, the main thing is to come back to the present moment, to connect better with our intuition. That’s where meditation comes in. Meditation teaches the importance in each moment of coming back to the present moment. It will be a daily moment-by-moment practice. In my limited experience, I have noticed those days where I’m more present in the moment, I have miracles happen to me on the daily. I receive abundance from everywhere. I am able to get work opportunities, ideas, and other amazing goodies for my business constantly. New individuals who will be able to make my life richer come up regularly. Here’s a recent example from my life. I wanted to make some extra cash monthly so I would be able to live a more luxurious life in Chiang Mai. I meditated on it, and asked the universe for an answer. Then I let it go. In the past, I would have worried about it, worked at it, pushed and pulled at the answer, and in general, given myself heartburn with all the stress and anxiety. Instead of all that melodrama, I decided to be calm about it. The next day, I received a call from an ex-colleague about his brother-in-law who is need of a marketing consultant. Insane! In my feeble, little mind, I would never ever in a million years have thought of this as an option. But as soon as I let go, and let the universe do its thing, this solution came to me as if perfectly aligned with who I am, what I want, and where I want to go. I love when the universe gives me exactly what I want because I listen to my intuition, stay present, and have faith in the process. Life is short. This isn’t just a cliche saying, but an actual truth. Before you know it, these moments will fly by us. We will be 80 or dead before we know it. In these moments that are flying by way too fast, it is better to stay present and truly alive. The type of meditation doesn’t matter when you are trying to build your intuition. The only thing that matters is that you are consistently practicing meditation every single day for at least five minutes a day. If you spend all of your time in the past or the future, the present moment is left behind and we are left wondering where the time went by. Stay here. Trust your gut. Stay aware. Alive. Here. Now. Great article! I’m so happy to have stumbled upon your website and podcasts.